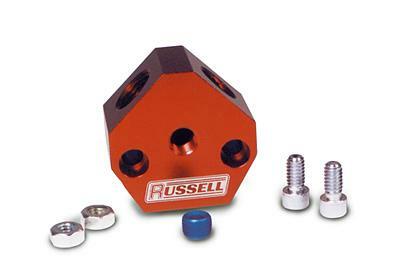 Connecting dual fuel lines to a carburetor has never been easier than with these Billet Y Fuel Blocks from Russell. Each one is manufactured from billet aluminum and features a 1/8 in. NPT pressure gauge port. Engineered for optimum fuel flow, they’re available with your choice of NPT or AN ports and are professionally anodized for a great appearance. True Y design for unrestricted flow, these Y-Blocks are machined from billet and feature male 37° connections, perfect for inline mounting. They are available in three popular sizes, -6, -8 & -10. The -8 & -10 included a 1/8” female pipe port for fuel pressure take off or gauge. Professionally black anodized.